With the indulgent holiday season coming to a close and the New Year rapidly approaching, I’m sure more than a few of you are starting to think about New Year’s resolutions. If you think you need to eat healthier or save some money, you’re not alone. The average American spends $3154 per year dining out, and since a restaurant meal costs three times as much as making a meal at home, a family of four could be saving $8000 a year by eating out less. According to a study by the Journal of the Academy of Nutrition and Dietetics, 92% of restaurant meals have too many calories, averaging 1205 calories, or over half the suggested calorie intake for a whole day! I’ve been wanting to write this post for a while now because I genuinely believe that packing a lunch is the best way to eat healthier and save money while showing your loved ones that you care. When the good folks over at Cuties offered to sponsor a post here as part of their #100DaysofSunshine, I knew it was time. A bento is a Japanese-style lunch to go packed in a compact box. Although bentos have a 1000 year history in Japan, it wasn’t until around 450 years ago when lacquered bento boxes started being used. Around 200 years ago, bentos took on a more refined form, being served during intermission at Noh performances. The advent of trains led to the popularization of bento for the masses as a quick, portable meal sold to travelers at train stations. These days, few rules govern what a bento is, but they’re a fun, nutritious way to pack a lunch from home. Looking at the photos illustrating this post, you’re probably wondering how anyone has the time to pack something so elaborate, but with a few simple tricks, a bento can be put together in a matter of minutes. No, you don’t need to go and buy a lacquered box to make a bento(although you can). I like using shallow 24-ounce food storage containers because they’re a convenient size that comfortably fits in a work bag. They also hold plenty of food for an adult when packed properly. If you’re making a bento for a small child, use a smaller container. The reason why choosing a container is so important is because it limits the amount of food you can pack while giving you a blank canvas to fill. Next you need to decide what you’re going to put in the container. I usually try to split up my bento so that it’s half vegetables, a quarter fruit, and a quarter other things such as protein and carbs. 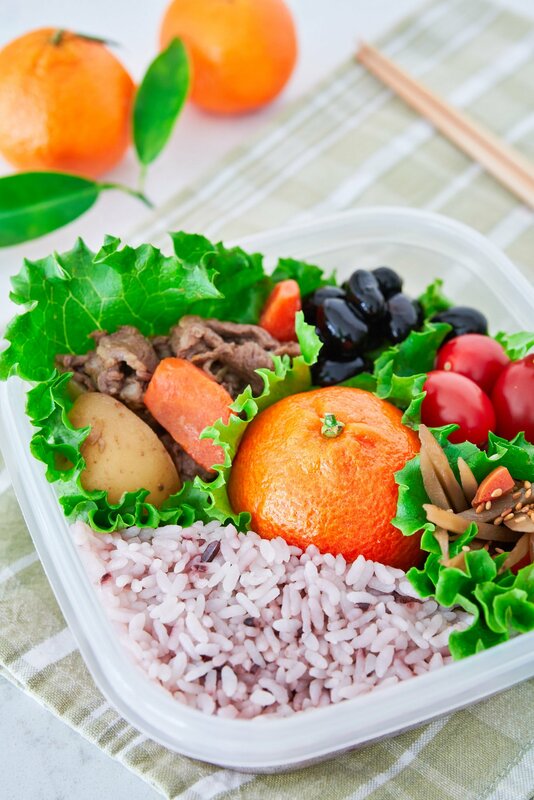 The key to sticking to a daily bento routine is to make it easy. Most of the foods that I add to my bentos are leftovers from the night before, which I usually pack straight into bento boxes after dinner. 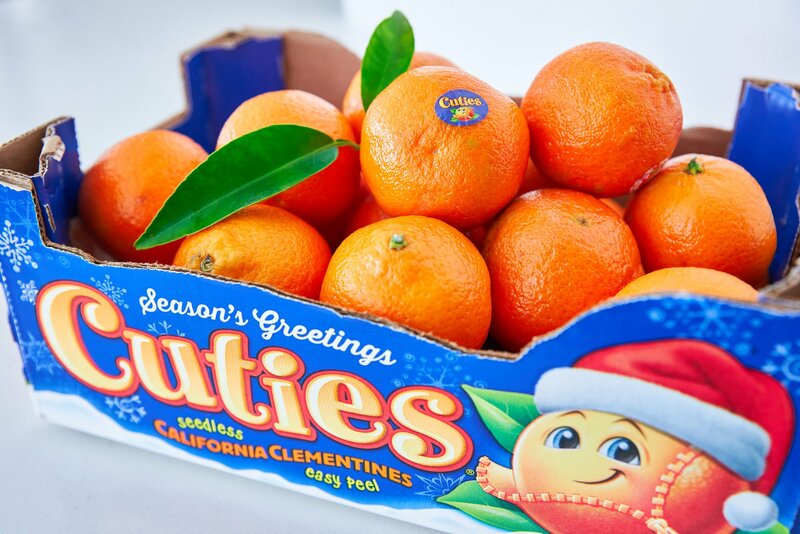 Because Cuties come wrapped in an easy-to-peel skin, they do just fine spending a night in the fridge alongside other foods. This means the only work I need to do in the morning is to add some fresh fruit and vegetables. The other benefit of using leftovers is that you have an incentive not to eat everything at dinner, preventing you from overeating. 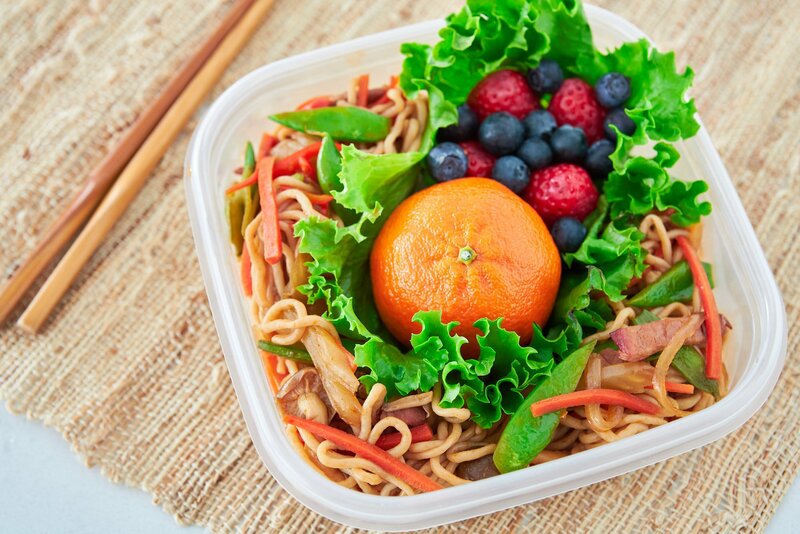 You’re also less likely to dine out on a weeknight if you know you need bento-friendly leftovers to pack for lunch the next day. The last step is to pack the bento box. This is perhaps the most daunting part of preparing a bento. If deciding how to pack a bento box feels overwhelming, to you, start off by placing a focal point in the box. 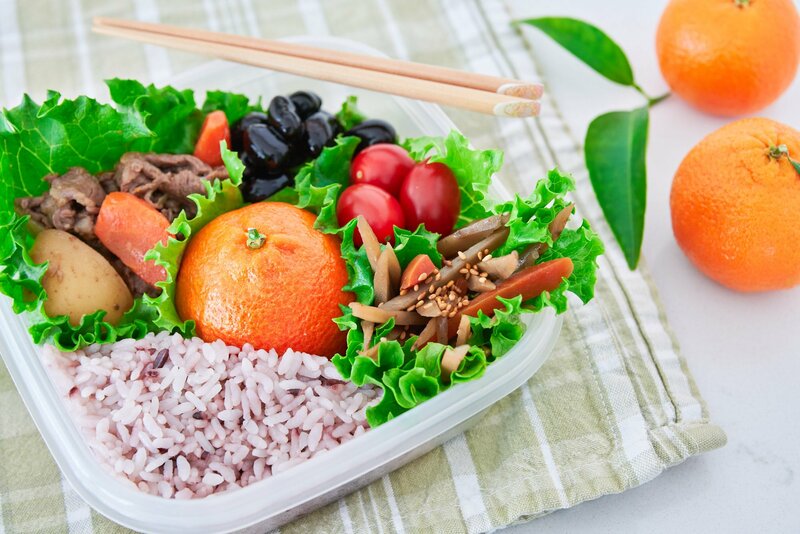 Putting a sunny orange Cutie in the middle of your bento box not only adds a splash of color, but it also makes for the perfect focal point that will make the rest of your bento practically pack itself. Use separators. This ensures that different parts of your bento don’t mix together. Some people use muffin cups or plastic separators, but I prefer using edible leafy greens such as frilly lettuce, kale, and cabbage as it adds color and nutrients to your bento. These will also help you reach your 50% veggie goal. Pack it tight. You don’t want a lot of extra space in your bento. Otherwise, everything in your box will get tossed around as you transport it. When in doubt use more lettuce. Make it colorful. I’m sure you’ve heard the advice that you should eat the rainbow to make sure you’re getting a good balance of nutrients. Planning a rainbow-colored bento is not only a great way to ensure it’s balanced, but it also makes it a feast for the eyes. To help inspire your leap into the world of bento making, here are three very different bentos I built around sunny, sweet, and seedless Cuties. This Japanese-style bento includes some leftover nikujaga (meat and potatoes), kinpira gobo (sauteed burdock), and kuromame (black soy beans), along with cherry tomatoes and multi-grain rice, all orbiting around a sunny Cutie. The leftovers don’t all have to come from the same meal, and you can make some sides over the weekend to use through the week. Bento’s don’t have to be filled with Japanese food. Sandwiches make for a wonderful addition to bento boxes. Just be sure you still hit all the major colors. This sandwich is filled with some leftover Chile Verde, which I pulled, and mixed with some of the sauce, along with some quick pickled red onions, avocados and cilantro on multi-grain bread. 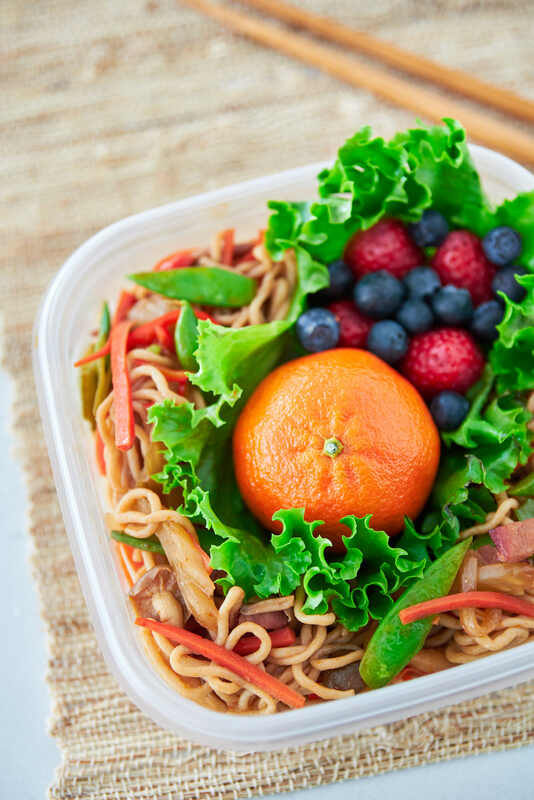 A bento-sized Cutie makes for the perfect spacer in the center, which keeps the sandwiches held together while making room for some grape tomatoes, ground cherries, and blueberries. My last bento is perhaps the simplest, with a sunny sweet Cutie surrounded by some leftover Yakisoba. I like to load up my yakisoba with veggies to cut back on the carbs, but for this one, I’ve gone one step further and used shirataki noodles, which have only 10 calories per serving. Some strawberries and blueberries go in to round out the rainbow, and you have a vibrant, flavorful lunch that takes less than a minute to pack. Cuties are back in-store, ripe and ready to eat, so start a routine of packing a healthy bento for you and your family and make 2018 the year you eat healthier, save money and spread some sunshine! P.S. This post was sponsored by our friends at Cuties, as always, the opinions expressed are my own.